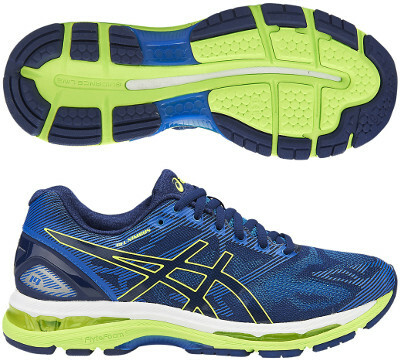 Asics Gel Nimbus 19 are neutral cushioned running shoes. The well known Asics Gel Nimbus 19 follows the latest update of its counterpart with pronation control Gel Kayano 23 and features FlyteFoam™ in the midsole to improve its position against marketing powered technologies from competitors like EVERUN in Saucony Triumph ISO 3 or Boost™ in Adidas Ultra Boost. Despite high price tag and typical marketing pitch involving lighter cushioning and enhanced response (to be confirmed by unbiased testers), the premium Gel Nimbus 19 will continue as the reference running shoes for neutral runners looking for generous plush cushioning to enjoy long distances. Following latest trends like FlyKnit from Nike or PrimeKnit from Adidas, upper gets an upgrade from its precedessor Nimbus 18 with seamless and more elastic mesh for more comfortable feel. Usual high density printing from Asics (FluidFit®) enables a modern and attractive design featuring a custom fit. As well as in other running shoes from the japanese brand there is available a Lite Show™ edition with higher density of reflective elements from 3M® to improve visibility on low light conditions. As mentioned above, major highlight in current Gel Nimbus 19 takes place in midsole with full length FlyteFoam™. Other elements in midsole are firmer SpEVA layer on top for improved response and old friend rear and forefoot Gel® cushioning system for responsive shock absorption on impact. Stiffness is provided by classic plastic shank (Trusstic System®) in the midfoot working together with heel counter. Outsole gets minimal redesign to increase flexibility and grip while keeps vertical flex groove (Guidance Line®) for smoother ride. AHAR+ rubber is used in more exposed areas for increased durability.